EXCLUSIVE: Preschool funding has been left off the agenda of today's meeting of the COAG education council in what is being labelled as "out of step" and a "snub" to the reform Australia's education sector needs. News Corp Australia has obtained a full draft agenda of the 21st education council meeting, to be attended by Federal Education Minister Dan Tehan and his state and territory counterparts in Adelaide. And while No Jab No Play, a review of NAPLAN data reporting and responding to education-related recommendations arising from the Child Abuse Royal Commission are all slated for discussion - preschool funding is not. This is despite the sector calling for long-term federal funding of preschools and a serious look at universal access to two years of preschool starting for three-year-olds for over a year now. The education council secretariat distributes the agenda for the COAG meeting, however ministers - particularly the federal minister can ask to have specific items included if deemed important. Parents of young children will be disappointed preschool funding has been left off the COAG education council agenda. Goodstart advocacy manager John Cherry said it was "shocking" preschool had been left off the agenda. Particularly when federal Labor had made a commitment to fund two years of preschool if it won the May election. "It does seem astonishing that the government has got its mid-year financial review next week, a budget in April and they really need to get a funding decision for 2020 and have a serious conversation about what we are going to do for three-year-olds," Mr Cherry said. "It's time for the Minister's Council to its job." Early Childhood Australia CEO Sam Page said the omission of a discussion on preschool was "out of step". "If education ministers aren't talking about early childhood education and the importance of preschool funding then they are out of step with leading thinkers, the entire education sector and parents. Basically everyone else talking about it," Ms Page said. "This is a very live discussion everywhere in Australia but yet apparently it's not on the agenda of our education ministers. It's just crazy." Labor has made a commitment to fund two years of preschool if it wins the May election. Executive director of The Parenthood, Alys Gagnon, echoed those sentiments and said parents wanted preschool certainty and leadership. "This is absolutely disappointing and it is a real shame it is not on the agenda and appears to have been snubbed," she said. While administration of preschool - the year before formalised schooling, known as kinder in some states - largely falls under the remit of the states and territories, the federal government provides a large pot of money to help in their administration. The Coalition this year committed $870 million under Universal Access National Partnership arrangements to continue Commonwealth support for preschool throughout 2018 and 2019 to ensure that every child has access to a quality preschool education for 600 hours (15 hours a week) in the year before school. 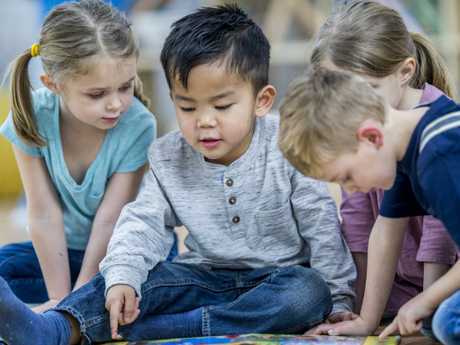 When News Corp Australia met with the OECD's head of early childhood education research Eric Charbonnier in Paris last year, he said investing in early childhood education was key to boosting Australia's educational rankings. Preschools rely on federal government funding for administration costs. Last year Australia ranked 39 out of 41 countries from the European Union (EU) and OECD in levels of quality and inclusion education for children. Opposition education spokeswoman Amanda Rishworth said the federal government was simply pretending to care about preschools. "Actions speak louder than words when it comes to the Morrison Government. They pretend to support preschools but can't even be bothered to list preschool funding for discussion by Education Ministers today," Ms Rishworth said. "There is no funding after next year in the Budget, providing no long term certainty for preschools, kindies, families and communities. Children, families and educators deserve better." Education Minister Dan Tehan did not return a request for comment prior to publication.